Perhaps nowhere is the importance of good leadership as apparent as in a sports team. A good sports team captain can lead his team to success and recognition; and can help a moderate team play better; whereas, a weak captain with poor leadership skills can hinder a team’s chances of competing and bonding successfully. Why Is A Good Sports Team Captain Important? An analysis done by various coaches showed that although there are a variety of reasons why teams do not achieve their potential and ended their seasons early – such as injuries, conditioning, poor officiating and eligibility – there is main reason is lack of good leadership. And while leadership does come from coaches, the real leaders come from within the team itself so selecting a good team captain is vitally important. Are You Sure You Want To Be A Sports Team Captain? If you are able to possess these qualities, then being a sports team captain can be one of the most rewarding leadership experiences you can have. How Can I Be A Good Sports Team Captain? Being a sports team captain is a great opportunity to develop the leadership traits that will help you succeed in your future career, whether this is as a sports athlete or in another field of work. But how can you know that you are providing good leadership? Take charge – don’t just rely on the coaches. For example, start the practice on time, even if the coaches are still getting ready or temporarily occupied elsewhere. Always do more than is expected – stay longer, run farther, play harder. Always take responsibility for your actions – don’t play the blame game. If you make a mistake or cause your team to lose out in some way, own up, face the consequences and move forward – you will be respected more than if you try to wriggle your way out with excuses. Lead your team by actions, not words. Anybody can talk – it is what they do that counts. Don’t put yourself above the rest of the team – just because you have the captain title does not mean that you should have any preferential treatment. 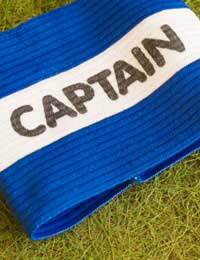 A sports team captain is subject to the same rules and consequences as the rest of the team. See yourself as one of the team, otherwise there will be a division between yourself and your teammates. In addition, continually try to be self-aware and improve your leadership skills. For example, think about the captains of various sports teams in the international arena and consider why they were chosen – was it because they are popular? The best player? Responsible? Honest? Dependable? A good listener? Motivating and inspiring? Remain calm and positive under pressure? See how they lead by example and follow in their footsteps to become a great sports team captain yourself. I have to write a letter of intent for my teams leadership position auditions and I am really struggling to write it. Any advice? @craigy as long as you're having fun that's the most important thing! I have the BEST leadership skills around here. Whenever my team plays they don't care about winning they just care about having fun!?? Oh, Yeah!